Mixed Greens is thrilled to announce their inaugural exhibition in the Glow Room Project Space: Carol Salmanson’s Diaphany. In May of 2005, Mixed Greens announced their arrival at 531 West 26th Street with glowing green windows. Over three and a half years, the unexpected surprise faded into a tired constant. 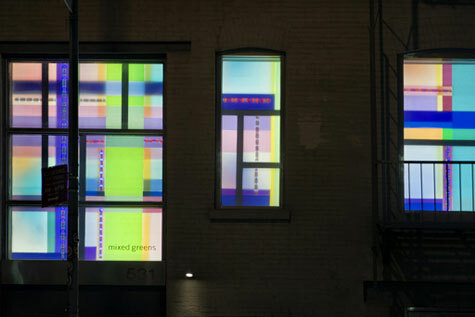 On November 13, Carol Salmanson will debut a new piece in the windows, transforming the Glow Room into an exciting new location for light projects. Salmanson’s work combines spatial and color concerns with architectural and theatrical elements. For Diaphany, she utilizes various colors of light to create a visually engaging pattern that mimics existing architecture and uses the space’s permanently installed scrim to its greatest advantage. The resulting piece is reminiscent of a fabric pattern, a map, an architectural plan, a color-coded information system or the back stage of theater. Salmanson’s work is the perfect debut for the project space. As someone with hereditary hearing loss, Salmanson has special interest in the non-verbal communication of emotion and a history of tapping into the energy and intensity of those things we take for granted. Through light, she explores unconscious perception and is the perfect candidate to change the experience of a walk down 26th Street.